A blog about my hobbies: Cross Stitching, Thread Crochet, Reading and Writing. 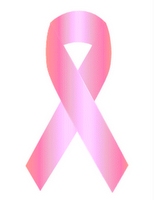 All works on this site, unless otherwise noted, are copyrighted to the author Missy H. (aka M. Hull). Please do not use any posts without permission of blog author. You can contact me via email. All in all today was a rough day thanks to the remainders of hurricane Irma. My back and pelvis were acting up, though not as badly as yesterday. To help distract myself from the pain and to aid in relaxing I did some stitching tonight while on a hangout with members of the facebook group The Stitching Nest. It was a lot of fun hanging out with my friends chatting, laughing, and stitching. 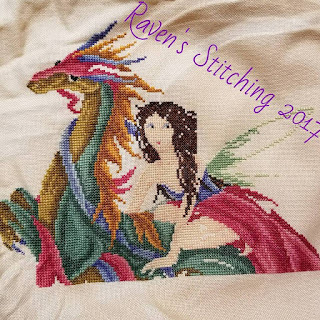 Here is the latest progress picture of Fairy on a Dragon by Joan Elliott. I've also been working on a post for my Living With Chronic Pain and Depression blog. It gives an overview of my day in the hopes of helping others to understand that being home all day with chronic pain is not the same as having a day off of work. It has been a rough few years for me due to health, depression, anxiety, and a lost stitchy bug. However I did pick my stitching back up recently after a nearly 2 year hiatus. I am working on Joan Elliott's Fair On A Dragon. I am stitching it with DMC floss on 28ct jobelen using 2 strands of floss over 2 threads. I am once again fighting back against depression induced apathy and trying to be a real person again, so I figured I could pop a post up on this blog. I am also running a stitching group on Facebook called The Stitching Nest. Right now it is a small group, but a good group. We have a lot of fun using Google Hangouts to stitch and chat together. A virtual stitching group! My daughter, who also stitches, helps me run the group. If you have a Facebook check it out. Well that's it for now. Hopefully I will post more as I have missed writing on this blog and writing in general. 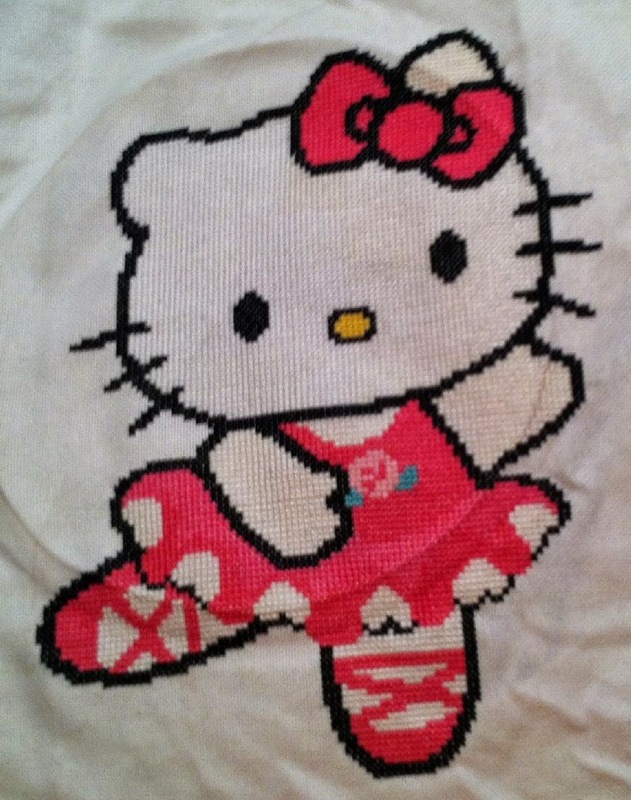 After I completed Hello Kitty I picked up my old WIP, Christmas Dreams from Joan Elliott. I completed it on the 26th of February 2015. It needs to be washed and pressed, then the beads will be added. Here is the pic for that one. 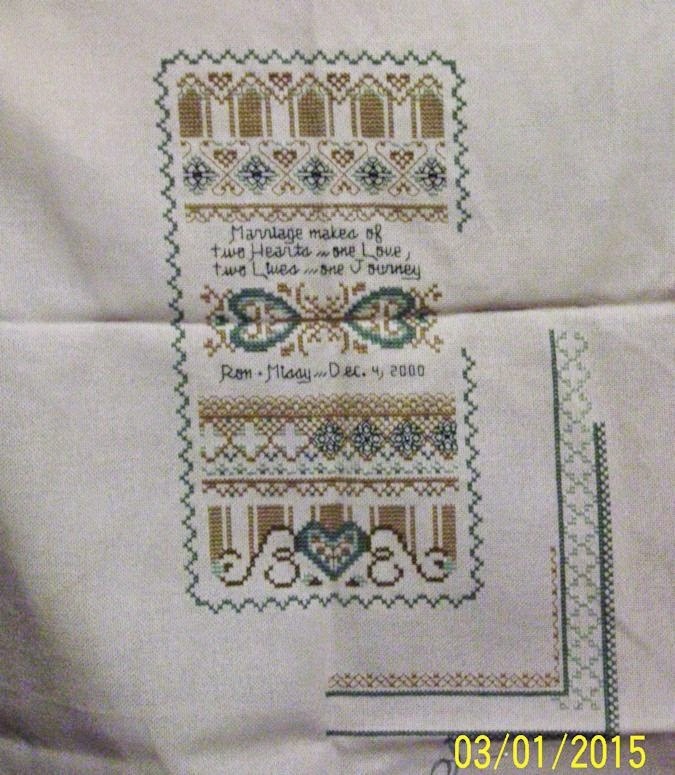 After finishing Santa I picked up the Anniversary/Wedding sampler that I started years ago for my hubby and I. 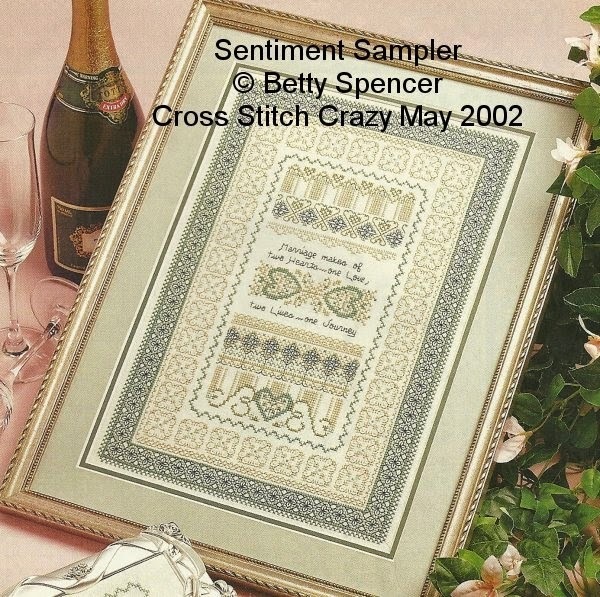 This is the Sentiment Sampler by Betty Spencer from thee American magazine Cross Stitch Crazy (May 2002 issue). Here is where it stood when I started stitching on it earlier today. I joined a Sampler SAL on the Cross Stitch, It's Fun Facebook group. I got almost all of the lower right corner filled in, which is the outermost border. 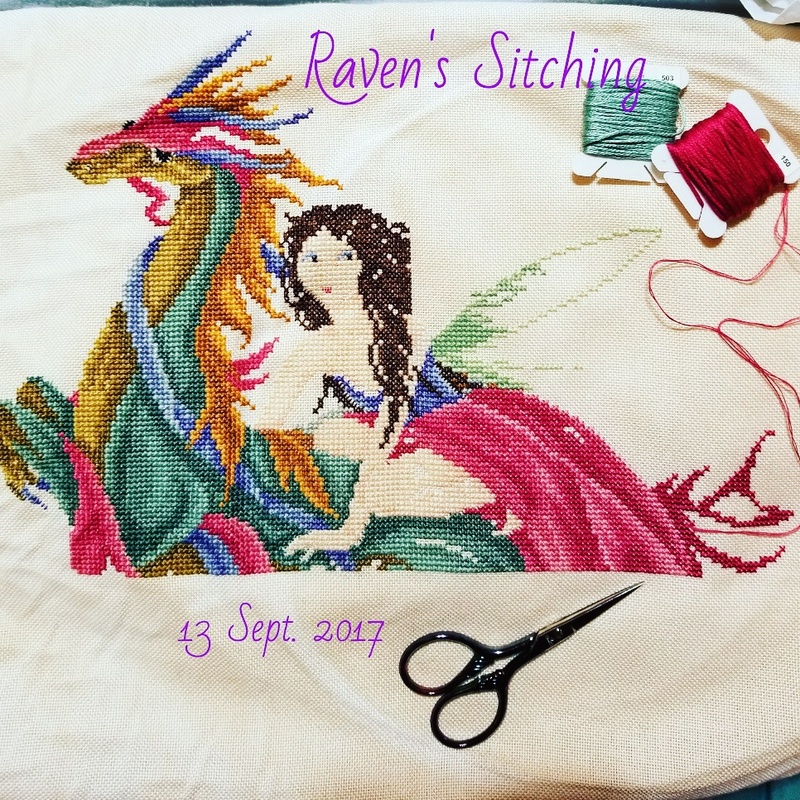 Here is what that sampler will look like (well, real close to this as I did change the center and am adding beads as well) when it is done. A friend from the Facebook group gave me a RAK. Her name is Heather and I am so very grateful! 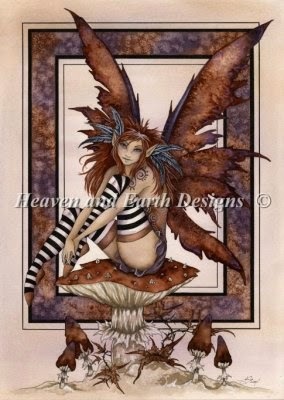 She sent me the pdf from Heaven and Earth Designs for Amy Brown's Mini Naughty Fairy. I don't know when I will get a chance to stitch it, but I do love it! I've been participating in the Facebook group and we hold daily Google+ Hangouts. These hangouts are a LOT of fun and go a long way towards keeping my stitching bug alive and well. Watching everyone stitching makes me want to stitch more and more. I am quite glad I joined them. They are a great group of people. I am a married woman who enjoys writing, reading, cross stitching, thread crochet, and playing World Of Warcraft (WOW). I have 2 children and 2 step-children. All pictures and text are copyright protected by M. Hull unless otherwise specified. Powered by Blogger.